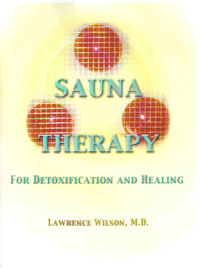 I highly recommend that you read Dr. Lawrence Wilson's book, Sauna Therapy for Dertoxification and Healing. Dr. Wilson has thoroughly reasearched the health consequences and benefits of using traditional and infrared saunas. He is the foremost expert on the subject of dotixification using saunas. Dr. Wilson is an encyclopaedia of natural health. His book, Sauna Therapy, contains a wealth of knowledge that will empower you to live free of cancer and other diseases. The lights inside the Vitra provide important medical benefits. Our body consists of seven major energy centers called chakras. These are situated along the length of the spinal column. Positively stimulating any chakra yields a plethora of specific health benefits. The color-blender light shade mixes red light (for the first and second chakras) with blue light (for the fifth and sixth chakras). The strategic blend creates a pink light that opens and nourishes the fourth chakra, which can improve the health of your heart and lungs. The colour therapy lights used in the Vitra sauna correspond to the following chakras.